Along with the Hamilcar glider, the Horsa brought in the elements of the regiment that didn't require the carrying capacity of the Hamilcar. This equipment would consist of everything from jeeps and motorcycles to men and supplies. The early versions of the Horsa were loaded and unloaded using a built-in ramp door from the side, along with metal channels to extend to the ground, as seen in the photo above. Although the above photo could be one of many airborne units unloading their motorcycles, the photo shows exactly what it would be like for the men of the Blitz Troop or other motorcycle mounted men of the regiment as they unload their vehicles from their glider upon landing. Later versions of the Horsa were equipped with removable tail sections, and hinges that allowed the cockpit of the glider to swing to the side, so that vehicles could be driven straight into the glider and removed straight out to speed up the loading and unloading process. Whereas the Hamilcar glider could only be towed by the Halifax bomber, the Horsa could be towed by a variety of tug aircraft, such as the Dakota transport or Albemarle bomber. The Horsa was the primary glider used by the British Army during the war, and was used operationally from the very first glider operation of the war in an attempt to destroy a heavy water plant in Norway (used in the attempt to develop the atom bomb by the germans) to the very last airborne operation of the war, "Operation Varsity". The photo to the above left shows the difficulty involved in loading a jeep into the initial version of the Horsa glider. The jeep barely fit as it was maneuvered around the corner and off the ramps into the cargo bay of the glider. Jeeps also had to be modified to do this by removing hand grabs, sections of the front bumper, the spare tire from the back, and either removing the steering wheel or cutting a section of the steering wheel off, as well as other modifications. The center photo above shows the ease with which a jeep and it's towed equipment (in this case a 20mm Polston anti-aircraft gun) could be left hooked together and driven straight out of the glider in the later models of the Horsa. 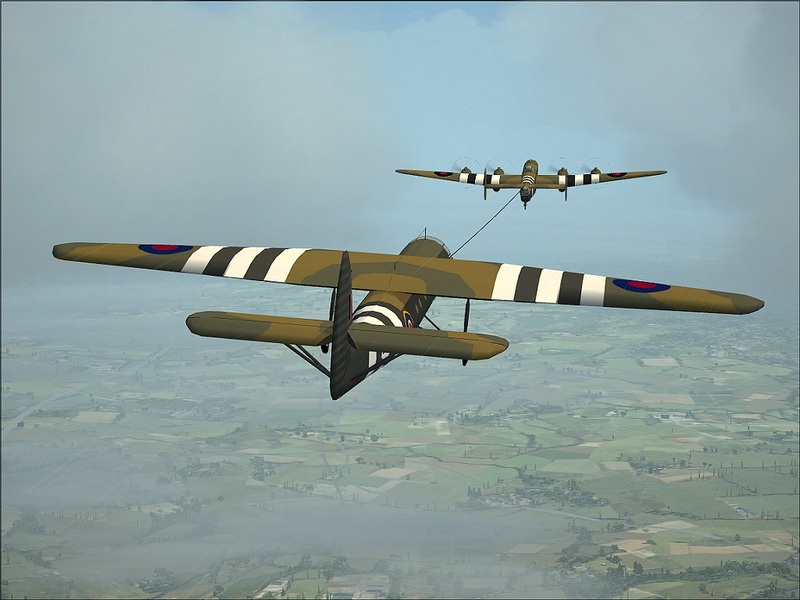 The above right photo shows a Horsa glider being towed behind a Halifax bomber, with the tow rope clearly visible connecting the two aircraft. This could be jettisoned by either the bomber crew or the glider crew. Link to the Assault Glider Trust. The AGT was founded in 2000 by members of the Glider Pilot Regimental Association (WW2 vets). They are building a replica Horsa, have a Dakota, are working on restoring a Hadrian (US CG4A WACO glider) and a Tiger Moth.